As always, a load of initiatives involving Cantine Ferrari scheduled during Vinitaly. In line with tradition, the first important appointment will be on Saturday 6th April – the day before the opening –, the Opera Wine at Palazzo della Gran Guardia in Piazza Bra with the 100 best Italian producers selected by Wine Spectator. Our Ferrari Perlé Nero Riserva Magnum 2008 will carry the standard of Cantine Ferrari. On Sunday 7th April, don’t miss the initiative by Gambero Rosso that along with Vinitaly will introduce, for the sixth year, the big tasting of the 447 wines awarded with the Three Glasses of the 2019’s edition of Vini d’Italia. Gruppo Lunelli will be the protagonist with Ferrari Perlé Zero, Cuvée Zero11 and Tenute Lunelli Ziggurat 2016. From 11:30 to 16:30 in the “Sala Argento” floor -1 Palaexpo – entrance A2. 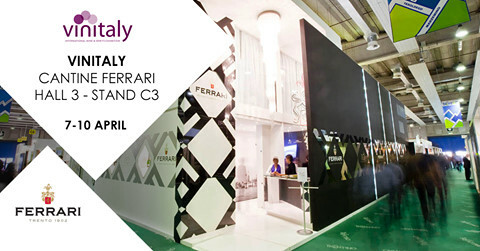 At the end, we will be all present at Vinitaly 2019 every day at sPad.3 stand C3 with all our Ferrari bubble. Come and visit us!